It may seem like bad things rarely happen to the rich and famous. And when things do go wrong, they just buy their way out of it, right? This may be true in many aspects of their life including the court of law, but it is far from true in the court of plastic surgery. Forget about your own problems for awhile and checkout our list of the very worst celebrity plastic surgery blunders of all time, influenced by vanity laced aspirations. Janice may have been in complete control when she rocketed down the runway and became the first modern-day supermodel, but she was clearly not in control when it came to keeping her face youthful. If you aren't old enough to remember her super fresh, young face smiling into the cameras before she went under the knife, take a good look at her before and after picture. First we see a budding young supermodel. Then we see a post-surgery plastic creation that is borderline supernatural. She has admitted to a lengthy list of surgeries including: breast implants, facelift, tummy tuck, neck lift, liposuction, and botox as well as lip injections. She has candidly admitted to spending well-over $100,000 on cosmetic procedures. Plastic surgeons around the globe often claim that cosmetic surgery makes you the best possible you. However, botched surgery can make you look like anything but yourself. That seems to be the case for former singer, Latoya Jackson. Her most dramatic surgery was her disastrous nose job, which definitely lands her on the list of the worst celebrity plastic surgery. 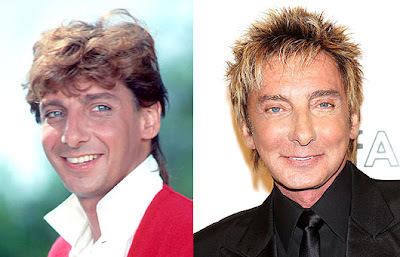 Barry has never publicly admitted to these alleged surgeries, but it is blatantly obvious that something has been altered on the face of Mr. Manilow, as the singing icon is looking awfully stretched and puffy in his recent photos. He is rumored to have had at least one facelift, and is believed to have received cheek implants or injectable facial fillers. If you ever wondered what botched surgery could do to a beautiful woman, take a look at this before and after picture of female rapper Lil Kim. She is believed to have been the victim of numerous bad plastic surgery procedures, including a notoriously bad nose job, breast implants, cheek implants, and additional nips and tucks. 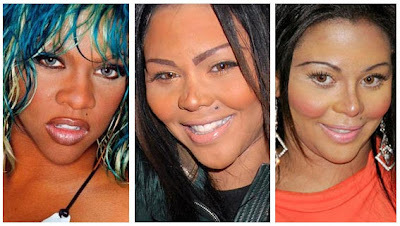 Current-day Lil Kim is a mere image of her former self, making her plastic surgery tale one of the worst of all time. 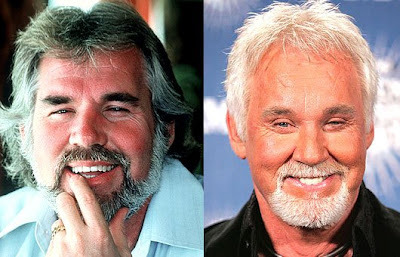 With a wife almost thirty years his junior, Kenny Rogers had to do something to keep his youthful charm, right? 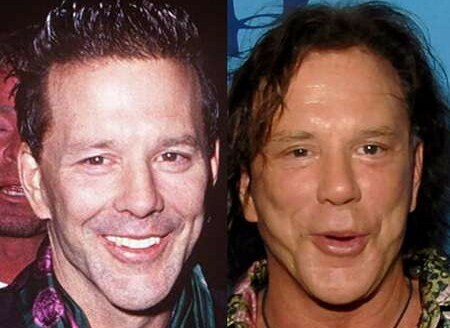 Unfortunately, growing up is all about learning lessons and Kenny learned a big one with his botched surgery: stretched skin can highlight your desire to be young, but it cannot actually make you appear young. 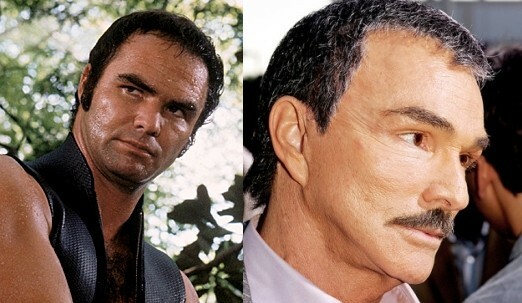 It was his ill-advised decision to undergo an eye lift that made his transformation so dramatic. His post-surgery result rendered him almost unrecognizable. Mickey has been labeled by many critics as having the "worst plastic surgery" in show business, however, Mr. Rourke lands just shy of the top spot on our list, placing fourth. The actor claims that his surgery choices were a corrective measure to repair his face after years of professional boxing. He was famously quoted as saying "Most of it was to mend the mess of my face because of the boxing, but I went to the wrong guy to put my face back together". 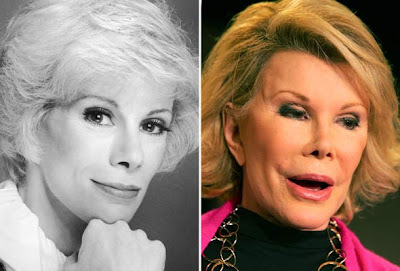 You cannot have a list of the worst celebrity plastic surgery without mentioning Joan. This is what it means to embrace plastic surgery as a way of life. No, she doesn't look old, but she doesn't exactly look human either. Forget the list of what Joan has had done. You could probably compile a shorter list of what she hasn't had done...yet. With that being said, we'll go ahead and list some of her plastic endeavors. Multiple facelifts, eye lift, nose job, cheek implants, breast implants, jaw implant, plus botox and injectable fillers. If you're budget amounts to four million dollars, you should be able to hire the best plastic surgeon in the world, right? But that's not how cosmetic surgery works. 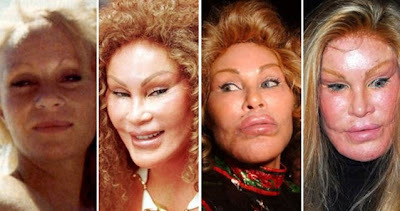 "Cat woman" Jocelyn Wildenstein has spent millions on her face, but apparently the best surgeon in the world wasn't able to successfully "beautify" Ms. Wildenstein. 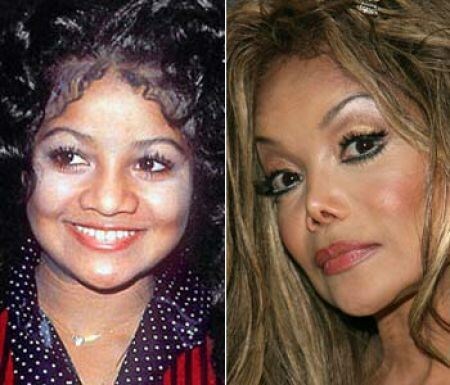 Her post-plastic surgery result is widely regarded as the worst plastic surgery in show business history. Ms. Wildenstein's list of procedures is rumored to contain: Multiple facelifts, eye lift, brow lift, cheek implants, chin implant, lip implants, botox and facial fillers. Jocelyn Wildenstein concludes our countdown of the worst celebrity plastic surgery. We only hope this 'list of terror' will discourage others from considering this very dangerous modern-day method of "self improvement". Instead, try seeking safe natural alternatives to surgery, which have proven to be highly effective. That's what they get for listening to their psychic advisors telling them to get surgery done. surgeons need to learn to say no to celebs no matter how much they are willing to pay for not needed face vamps they look disgusting id be ashamed of the over all look there is no perfect look and the closest to it is the natural features you have been given everybody has issues with themselves at some point but do what normal people do get on with life or see a Councillor if its that bad stop ruining our future for the new generations to come. I do not see how Suzanne Somers failed to make the list. She looks like a monster! what about mrs elvis presely-she used to be pretty? Joan Rivers, still just as ugly! - Ew, They All Lookk Horrible!!! You guys should have posted Rose McGowan. She looked so good and then got unnecessary plastic surgery. WOW. They should sue for gross (and I do mean gross) malpractice. Where's Michael Jackson on this list? They missed Donatella Versace She's tied with cat woman for the worst mess.